CAUTION! Working with or around burning and hot oil/grease can be dangerous, especially when proper safety precautions are not taken. Water should never be used to put out an oil or grease fire. Use dry sand or dirt. Because of the variations in materials and workmanship there are no guarantees on the information in/on this web site. This information is simply what I have been successful with in my own experiments. I will not assume responsibility for any injury, loss, or damage that may result from following the instructions, advice or plans on this web site. There are always dangers in foundry work and they have been pointed out whenever possible but it is not the purpose of this web site to, nor is it possible to mention all known or unknown dangers. Here is a diagram of "The Brute." The burner is basically a steel tube into which air blows into. Oil enters near the tip and the air stream blows the oil into the furnace where it ignites. The furnace must be hot to ignite the oil. I preheat the furnace either by running it on propane for 5 minutes then switching to oil or burning some wood in the furnace to ignite the oil. The fuel hose has an inner diameter of about 5/16". It must be large enough for at least 2 gallons per hour which is about 1/2 to 3/4 cooking type measuring cups of oil per minute. Actually more is best so you can regulate it down to the desired flow with the valve. Preheating the oil is optional but will make it easier to burn. The optional propane attachment is just a small piece of pipe that allows propane to flow into the 2" pipe. No special jets, or mig tips or anything like that. Once the propane is in the 2" pipe it mixes with the air from the blower. The air/propane mix ignites and burns in the furnace. To ignite the propane I put a wad of newspaper in the furnace and ignite it. Once it is well ablaze I turn on the blower and then open the propane valve. The propane usually ignites immediately. If the propane does not ignite, close the propane valve and let the blower ventilate the furnace of propane fumes and start over with a larger piece of paper (or paper with a few drops of oil on it) if necessary. Burning pieces of paper will be blown out of the furnace vent so use caution. 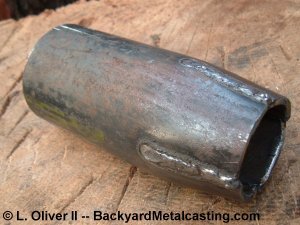 Here is a short piece of pipe that I'll demonstrate forming the taper on. The taper on the end of the burner acts as a venturi. I have however built a burner without a taper and it also sprayed the oil nicely so it might not be necessary. But the Brute uses one for insurance. 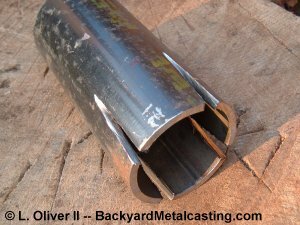 The taper in the tip of the burner tube is made by first cutting four "V" shaped notches 1-3/4" long and 5/16" wide at the ends. These notches are 90 degrees from each other making them evenly spaced. An angle grinder with a cutting disk makes this task pretty easy but a hacksaw will work also. Bend the flaps between the notches downward evenly (I tap them down with a hammer) until the ends contact. The result is a tapered end. A weld bead along the seams will seal and strengthen everything. To see the burner melting iron visit this page. The cheapest method of igniting the burner is by starting a fire in the furnace and letting that fire ignite the oil. 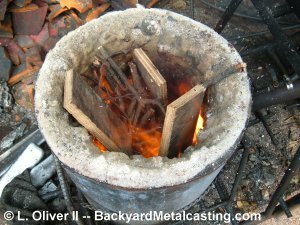 I usually use this method because it allows me to burn away a lot of the scrap wood left from other projects. First ignite some big wads of paper in the furnace. Once the paper is burning add some strips of cardboard. Small sticks are thrown in after the cardboard is burning. When the sticks are thoroughly ignited turn the blower on. 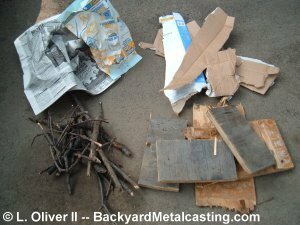 The larger wood scraps can be added a couple at a time until they ignite. Here is the wood fire building itself up. Once well ablaze it will easily ignite the oil. When the wood is mostly coals but there is still a strong flame coming off it (usually after about two minutes) I turn the oil on. 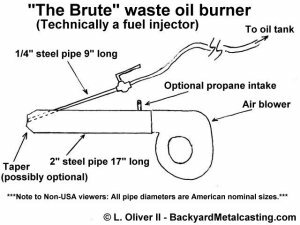 The easiest method to ignite the oil is to first run the burner with propane. 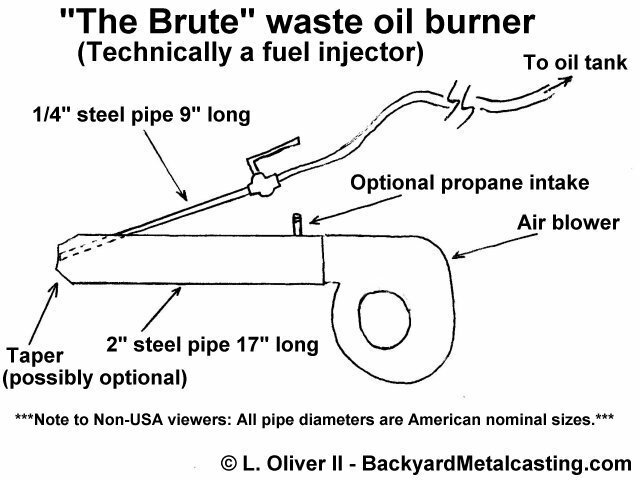 "The Brute" as detailed in the diagram has a propane hookup point for easily attaching the hose. Air hose quick couplers make connections quick and easy. Running the furnace on propane for five minutes easily ignites the oil. The procedure I use is to wait five minutes with the propane burning. Then I open the oil line's valve. 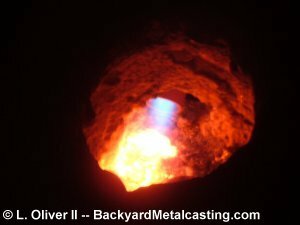 Once a large flame forms in the furnace and begins to blast out the vent hole I know the oil has reached the furnace and ignited. As soon as this occurs (It's usually within 5-10 seconds) I completely turn the propane off and the oil is adjusted as necessary. I currently do not use any preheating with this burner. No preheating of the oil (but I may in the future). The "hot tank" shown on the brass casting page was removed after I scrapped the last box burner and started using injection burners. There's no air preheating either. In fact I don't ever plan to preheat the air because hot air is less dense and therefore contains less oxygen. This view is reinforced when you consider that cars and trucks that use turbochargers often include an item called an "intercooler" which cools the air blast from the turbocharger thereby providing additional horsepower. I've also noticed that the furnace runs better during cold winter days then it does during the hot summer. This seems to indicate that air density is more important than oil temperature. I've run the furnace on days as cold as about 20 degrees F. and it ran perfectly. I merely increased the preheat time by using more scrap wood. A thorough preheat of the furnace is a must. The oil used on these cold days was always used motor oil which doesn't thicken nearly as much as vegetable oil (used cooking oil). I've had a jug of used cooking oil that literally turned to slush when I had it stored on the uninsulated outdoor steps leading to the basement. Another important thing to note is that there is a minimum amount of oil that needs to enter the furnace to sustain smokeless combustion. This seems to be the result of the burning process. Since liquid oil doesn't burn, but rather the oil vapors burn, if the oil flow doesn't keep up with the vaporization rate then there won't be enough heat to both vaporize the oil and then ignite the resulting vapors. I call the minimum quantity of oil needed to maintain clean combustion the "minimum clean combustion flow" or "M.C.C.F." This quantity changes based on furnace size and that change can be calculated mathematically by what I call "Lionel's oil equation" (Hey why not?!). Unfortunetly I haven't yet formulated the equation... As mentioned earlier in this page the "MCCF" for my 10" bore furnace is about 2 gallons per hour which breaks down to roughly 1/2 to 3/4 of cup per minute (cooking type measuring cup). I was not able to obtain this with 1/4" copper tubing. It would produce smoke and a lot of soot and often extinguish. So I upgraded to larger tubing with 5/16" inner diameter. I'll detail a miniature waste oil burner on the next page. Copyright © 2008 by Lionel Oliver II All Rights Reserved.